This could be called the "season of manifestation". In the past few Sundays, we have seen Christ manifested first, to the Gentile world (Maji) and then last Sunday to the Jewish world (via John the Baptist). And now this Sunday, Jesus is revealed as the long awaited Davidic King prophesied about by Isaiah and others. In our first reading (Isaiah 8:23-9:3), Isaiah wrote during a time of great duress as the northern tribes of Israel were being besieged by the Assyrians. In great confidence, Isaiah foretold of a new Davidic King who would bring "abundant joy and great rejoicing". This same passage is proclaimed every Christmas Eve during the night Mass, heralding the birth of the Christ child. First the Lord degraded the land of Zebulun and the land of Naphtali; but in the end he has glorified the seaward road, the land west of the Jordan, the District of the Gentiles. Anguish has taken wing, dispelled is darkness: for there is no gloom where but now there was distress. The people who walked in darkness have seen a great light; upon those who dwelt in the land of gloom a light has shone. You have brought them abundant joy and great rejoicing, as they rejoice before you as at the harvest, as people make merry when dividing spoils. For the yoke that burdened them, the pole on their shoulder, and the rod of their taskmaster you have smashed, as on the day of Midian. In our Gospel reading (Matthew 4:12-23), we hear this same passage from Isaiah, now being fulfilled as Matthew described Jesus' return to the very same area decimated by the Assyrians so long ago, to begin his public ministry as the new Davidic King.. 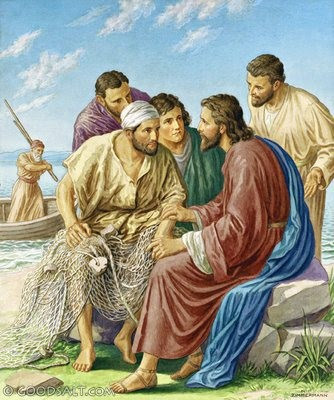 When Jesus heard that John had been arrested, he withdrew to Galilee. He left Nazareth and went to live in Capernaum by the sea, in the region of Zebulun and Naphtali, that what had been said through Isaiah the prophet might be fulfilled: Land of Zebulun and land of Naphtali, the way to the sea, beyond the Jordan, Galilee of the Gentiles, the people who sit in darkness have seen a great light, on those dwelling in a land overshadowed by death light has arisen. From that time on, Jesus began to preach and say, "Repent, for the kingdom of heaven is at hand." In our Epistle reading (1 Corinthians 1:10-13:17), St. Paul sought to end rivalries and division in Corinth be focusing on Christ as the true center and wisdom of the Church. I urge you, brothers and sisters, in the name of our Lord Jesus Christ, that all of you agree in what you say, and that there be no divisions among you, but that you be united in the same mind and in the same purpose. For it has been reported to me about you, my brothers and sisters, by Chloe's people, that there are rivalries among you. I mean that each of you is saying, "I belong to Paul," or "I belong to Apollos," or "I belong to Cephas," or "I belong to Christ." Is Christ divided? Was Paul crucified for you? Or were you baptized in the name of Paul? For Christ did not send me to baptize but to preach the gospel, and not with the wisdom of human eloquence, so that the cross of Christ might not be emptied of its meaning. Once again we see the ancient prophesies of the Old Testament being fulfilled in the New Testament by Jesus. This revelation helps us see that God's plan of salvation and self-revelation has been ongoing since the beginning of creation. We are called to recognize it and cooperate with it - we pray for the grace. The Fiesta has been a tradition for over 60 years, bringing together parishioners and community members for one big party each year. From planning throughout the year to the over 400 volunteers that give their time, everyone's help is important to making this fund-raising and friend-making event a success. How can I help? It takes generous sponsors, organizers, donations, and many hands during this event. To sign up as a volunteer for this year's event on May 31 and June 1, use our volunteer database. Drop off your book sale and plant sale donations in the greeting area. Store-bought pies, cookies, and cupcakes for our Sweets Booth can be dropped off starting Friday, May 31. For more information about anything Fiesta-related, visit this page. Keep watching the bulletin for additional annoucements. Spread the word to your friends and neighbors - this is one event you don't want to miss!